When it comes to senior care options, you have a lot of choices at your disposal, including assisted living, in-home care, memory care, adult day care and many, many more. However, not one of these options will work for your loved one if they are resistant to care in the first place. Resistance to care is never easy to deal with, especially when you know that your loved one is at risk for getting hurt or wandering off if they are left alone. No company understands just how serious of a problem resistance to care can be quite as much as we do here at A Right Place for Seniors. That’s why we have come up with this guide to help you learn how to cope with your loved one’s resistance to care. Try to understand why they are resistant to care. Before you take any steps to try to convince your loved one to move to a facility or to allow an in-home care aide to help them out around the house, it’s essential that you try to understand why your loved one is resistant to care in the first place. Put yourself in your loved one’s shoes. Change is never easy to deal with, especially when you’re faced with moving out a house that has been your home for most of your life. 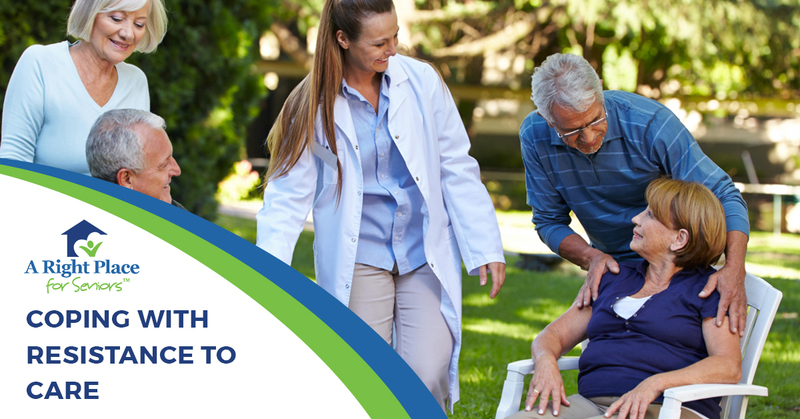 Combine that with the challenges of going through the personal changes that make senior care necessary in the first place, like an injury or illness that has led to the loss of independence, and anyone can see why some people are so resistant to care. The fact of the matter is that being forced to make the transition from living independently on your own to having to rely on someone else to care for you is never going to be easy, and a little compassion will go a long way. If your loved one is able, have a frank, honest conversation about their need for care, as well as the options available to them. It’s essential that you are extremely careful about when and how you have this conversation. You can start by carefully choosing the right time to talk. Don’t try to talk with your loved one when you or they are frustrated or angry. When emotions are already running high, there’s a good chance that the conversation could result in arguments, angry words or an even more stringent resistance to care. Instead, choose to have a conversation with your loved one when you are both feeling content and relaxed. When you talk with your loved one about their needs and their options, it’s important to really listen and to make them feel heard. As we mentioned, making the transition from living on your own to needing care is hard enough as it is; don’t make it worse by making your loved one feel as if they have no choice in the matter. Explain the benefits of care. For some people, resistance to care occurs because they really don’t understand it or they have misconceptions about it. If your loved one doesn’t really understand how a certain care option could benefit them, they aren’t likely to want to give it a shot. And, make it a point to explain the benefits of care for their own specific preferences or needs. For example, say your loved one is a master bridge player, but they can no longer drive themselves to their weekly bridge game with their friends. Explain how an in-home care provider could help them get to the bridge game, or how the assisted living puts on a bridge game for its residents every week. Once your loved one understands how care could benefit them, there’s a good chance they will be more open to it. Make them a part of the decision process. If your loved one has Alzheimer’s disease or another form of dementia, they might not be able to make any decisions about their care. But, whenever it’s at all possible, it’s essential that your loved one is involved in any decisions about their care and their future. Think about how you would feel if you were suddenly told you had to move somewhere, or that someone would be coming to your home to take care of you, and you had no say in the matter. Chances are, you wouldn’t feel good about it. Don’t do this to your loved one. 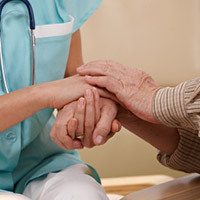 It will only make it harder on their caregivers to meet their needs and strain your relationship with your loved one. One of the best ways to open your loved one’s mind about receiving care is to take a trial run. The unknown is always scary, but when your loved one sees and understands exactly what they can expect from a facility or caregiver, it will help to ease their fears and allow them to see the potential benefits involved. If you’ve done everything in your power and your loved one is still resistant to care, it might be time to get a professional involved, especially if it’s dangerous for your loved one to live at home by themselves because they are at risk for wandering off or injuring themselves. There’s a chance that, while they might not be willing to listen to you, they may be willing to listen to their doctor, care manager or even lawyer about why it’s important for them to receive care. Let us provide you with the senior placement services you need. Coping with resistance to care can be challenging, but once you’ve convinced your loved one that they need care, your job is not done. You still have to find the right senior care option for their needs, and that is where A Right Place for Seniors comes in. We offer no-cost senior placement services, and our Senior Living Consultants have the experience and the expertise to help you find the right solution. Contact us today to get started.